Whether you're planning on having a simple wedding cake or a more elaborate masterpiece, the variety and choices available to you are endless. This sweet work of art does more than just provide dessert though, it also decorates your space and communicates your unique wedding style to your guests. With so many choices, we wouldn't blame you for getting a little overloaded, so here are our top wedding cake styles that we love...hope they provide some inspo to you. Rustic wedding cakes top the list of the most sought after wedding cakes for 2019. The rustic buttercream semi-naked cake with fresh florals (above image) by Sweetcakes Co, has a romantic, country feel with a touch of glamour added by the addition of gold flecks and the gold wedding cake topper. We love this rustic wedding cake for it's simple, understated beauty. Deep reds + marsala blooms offset the semi-naked rustic style of this romantic wedding cake. The beauty of semi-naked, buttercream cakes is in their versatility. The addition of flowers, fruits or delicious drips can transform a rustic style semi-naked cake to suit your individual wedding style and colours perfectly. These beautiful cakes draw on inspiration from the natural world and can be as earthy or elaborate as desired. Crisp greens + seasonal fruits for a rainforest inspired wedding. We love how the exposed cake underneath the buttercream adds to the 'wooded' look. We adore this three tiered semi-naked native cake – Inspired by the growing trend of native florals on a semi-naked buttercream backdrop. A touch of elegance is added with gold leaf embellishment and a contrasting caramel drip. This two tiered beauty was inspired by succulents and garden surrounding. It's outstanding features include a textured buttercream base inspired by the textures and divots of a rock face, plus a natural semi-naked finish with neutral tone succulent and filler florals. This irresistible cake is rustic and elegant at the same time. The fruits, nuts and greenery are delicate in their placement and add the perfect dash of colour to contrast the rich 'wooded' look achieved through the chocolate base. And the top tier, with the beautiful smell of the chocolate that covers it does not let you forget its presence...if you love chocolate, this one is perfect! If you're looking for a bit of glamour in your wedding cake, metallic wedding cakes may appeal to you. You can add in a little or a lot, depending on your style of wedding. The silver beads on this classic two tier, fondant covered wedding cake adds a touch of glamour without going overboard. Match these beads to the embellishments on your wedding gown and the floral colour to your wedding colours and you have a simple, yet glamorous wedding cake to complement your style. 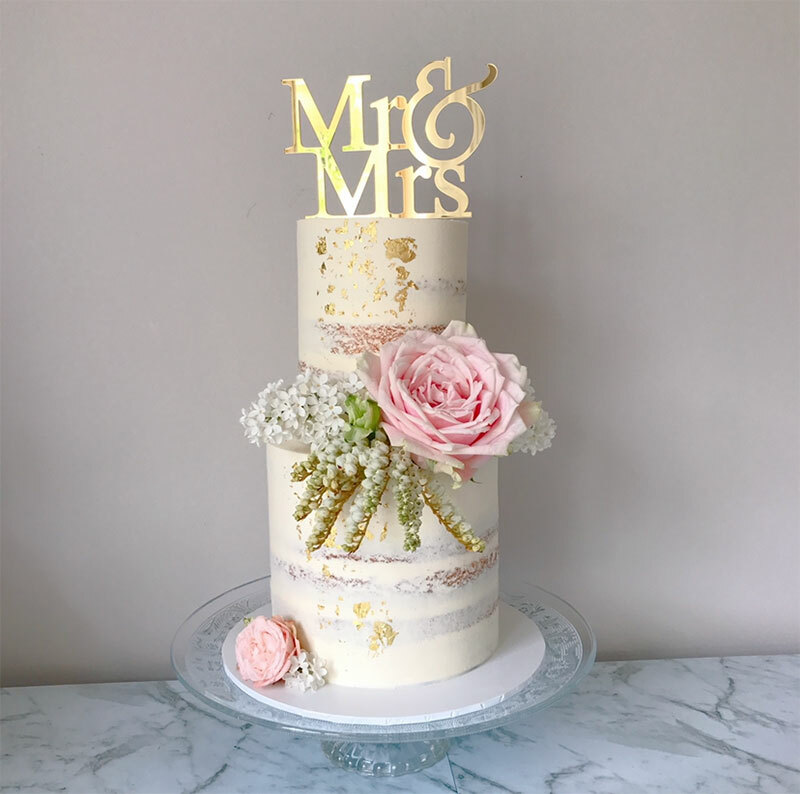 This soft and romantic dimmed gold lustre wedding cake is another stunning way to combine metallics on a larger scale. This painted on gold technique is an effective and creative use of metallics – teamed with decadent gold macaroons and flowers it takes on a very elegant, rustic feel. Sometimes a dash of gold leaf can lift a cake and make it truly wedding worthy. This lovely cookies and cream mudcake filled with cookies and cream ganache is adorned with 24 carat edible gold leafing and fragrant Ice Breaker Roses – who wouldn't feel special eating such a cake! Delicate frills, rosettes and ruffles give wedding cakes a gorgeous, feminine finish. Whether white on white or in beautiful ivory or popular blush hues, ruffles soften and add a touch of elegance. This gorgeous rosette ruffles wedding cake is a 4 tiered masterpiece, combining different textures to make a classy wedding cake – perfect for this wedding held at Versace Hotel. The inspiration for this Desert Boho wedding cake was taken from a macrame arbour used for this wedding. Delicate strings of sugar were pulled to recreate the macrame in cake form - Boho brides, how could you not love this style! It is different to the usual semi naked cake, but perfectly fits the theme. Cake created by: Sweet Society Co.
A three tier double barrel cake, covered in fondant and textured using an embossing mat and shine spray. Decorated using over the top flowers to complement the colour palette of the event. This wedding was at Brisbane’s Black Bear lodge which is a live music bar featuring edgy decor such as exposed brick and dark timber. To create an effortless edgy feel to the cake, inspiration was taken from aged, textured leather. Brisbane florist, Wallflower was then enlisted to provide over the top flowers and add femininity to the cake. This beautitul cake has the right balance between the romantic and the modern. We love the soft colours and the texture of the fondant giving it a marbled effect. This amazing cake is a modern, cheerful and daring cake, however it doesn't leave out the romanticism that a wedding cake should have. This hand painted fondant cake with fresh flowers is so original. If you are yearning for a cake with a difference, this cake is perfect for a modern wedding. Want to see more cakes? Get more inspo by visiting each of the cake designer's profile links in this article, or visit our cake wedding directory. Our advice is to look at cake decorator's work, then choose someone who listens to your ideas and will work with you to create the cake you've imagined for your special day. Not only is it Australia's capital city, Canberra is also home to some of the most magnificent locations for weddings. Summer has ended, but in Queensland and Northern NSW, that doesn't mean the end of beach weddings for the year.